Image courtesy of Library of Congress Interior of the House Chamber at Congress Hall in Philadelphia, Pennsylvania. On this date, the First Congress (1789–1791) convened in Philadelphia for the opening of its third and final session. Congress had just relocated from New York City, and awaited the construction of a permanent Capitol along the banks of the Potomac River, according to the provisions of the Residence Act of 1790. A spirited debate in the House occurred to determine the site of the temporary Capitol. Members were divided over whether to remain in New York City or to move to Baltimore or Philadelphia. With a vote of 38 to 22, Members chose Philadelphia as an interim capital, largely because the city served as the social, financial, cultural, and geographic center of the young nation which stretched the eastern seaboard. 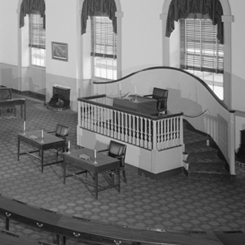 Not originally designed for the needs of the new government, Philadelphia’s Congress Hall held both the House and Senate Chambers. Committee rooms and the Clerk’s office were located in another building. Philadelphia served as the nation’s capital until 1800, when the federal government moved to its permanent home in Washington, D.C.